Roaring Fork Motor Nature Trail is a remarkable accomplishment by the National Park Service, a slow and easy drive through nature that’s as richly rewarding as a hike or nature ramble, with beautiful scenic views, along a mountain river and through lush forest teeming with wildlife, but in the comfort of your car. Situated just outside of Gatlinburg in Great Smoky Mountains National Park – one of the few national parks that don’t charge admission – the motor trail is a life saver for families with small children and people with limited access. It also seems to be one of the area’s least known attractions – or best kept secrets – but everyone who experiences it falls in love with it. The one-way, narrow road is a 5.5 mile loop that winds past many historic buildings, log cabins and water mills. Partly following the bank of the Roaring Fork, the motor trail intersects with several hiking trails and scenic places to park the car and stroll around. The old Noah “Bud” Ogle farmstead offers an insight into the past with a self-guided nature trail that is a great favorite with visitors. Picturesque settings abound along the trail, giving a sense of what the settlers woke up to each day. Reagan’s grain mill sits in an especially pretty setting, right on the motor trail, beside the Roaring Fork. The trail first ascends Piney Mountain to an overlook at about 3,000 feet. These are the mid-elevations you hear about during the fall colors season, which usually reach their full displays in the second half of October. The entrance to the motor trail is just past the parking area for Rainbow Falls. The motor trail intersects several hiking trails in its course, including the Trillium Gap Trail, Grapeyard Ridge and Baskins Creek. And the trailhead to Grotto Falls is right on the motor trail. As well as the local sights, there are two good overlooks along the trail with great views. Cameras are a must, and bear sightings are frequent. Remember, with bears especially and with all wildlife, the unbreakable rule (and fine-able offense), to be ignored at your peril, is to stay away from wildlife and use a zoom lens for closeup work. 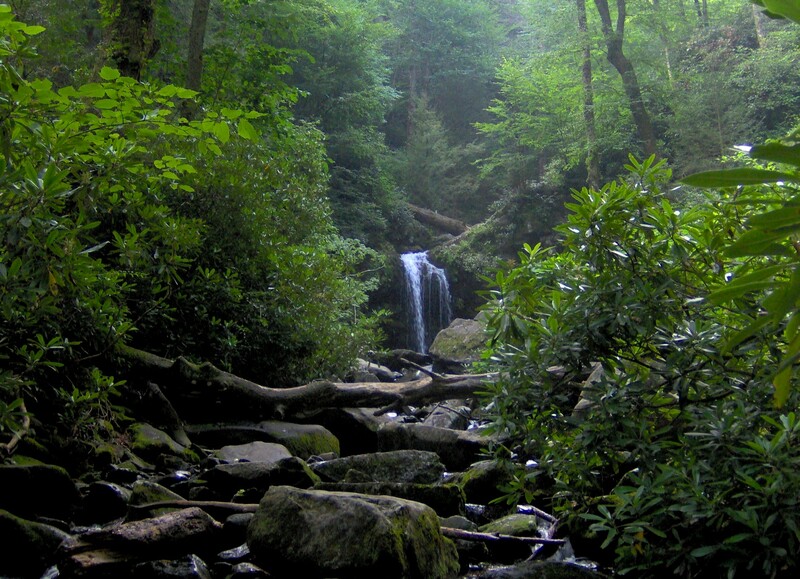 Roaring Fork descends about 5,000 feet in its journey from the slopes of Mt LeConte to its confluence with the Little Pigeon River. As with all waterways in Great Smoky Mountains National Park, rainfall can turn a placid stream into a surging whitewater. The most fun time to drive the motor trail is after a good rain – the scenery is washed clean and sharp, and the roar of the waters all around demonstrates how Roaring Fork gets its name. At the end of the trail before it re-enters Gatlinburg is a unique waterfall known as Place of a Thousand Drips. This is one of the two waterfalls in the national park that are visible without leaving your vehicle. Numerous intricate channels are carved into the rock slopes from the water, almost appearing as a deliberate design. See more on this waterfall in our feature: Place of a Thousand Drips: The Smoky Mountains Best Waterfall. To get on the trail, follow Airport Road (Historic Nature Trail Road) from Traffic Light #8 on Parkway in Gatlinburg, into the national park. Find the motor trail just past Rainbow Falls trailhead. At the start of the trail you should also be able to purchase a booklet that will show you all the things to enjoy, explaining the numbered posts along the route. Or you can buy it online in advance – visit the park’s official online store and check out the Roaring Fork Motor Nature Trail Map and Self-Guiding Tour. Roaring Fork Motor Nature Trail is open for three seasons and closed in winter. Buses and motor homes are not allowed, and couldn’t fit anyway. The best advice is slow down and be prepared to take side tours at any of the many stopping places. Treat it like a nature hike on foot – which it could well have been without the vision of the Park Service. It’s a hike through old-growth, dense forest filled with sights and sounds, and with the rare privilege of being able to drive.